"tPackageExplorer" is the application which checks the resource information on Android application. The tool "Hierachy Viewer" is prepared for AndroidSDK. In this tool, the screen layout of the application installed in the terminal can be checked. tPackageExplorer is the resource information on the application installed in the terminal similarly. It is the application for developers which can be checked. When Apple Computer gets a longtime Mac user to imagine the same application (edit of a resource cannot be performed) as "ResEdit" distributed free, it may be intelligible for him. *Although it may seem that the special thing is done, no route authority is acquired. It is application safe in security. When tPackageExplorer is started, it is a screen displayed first. The acquisition result of the application list information installed in the terminal is displayed on a screen. The following functions can be used by displaying an option menu. The application information installed can be updated. pre-installation -- an application -- a display or pre-installation -- an application -- except can be changed to a display. Function restriction can be canceled by purchasing an item by the fee collection in an application. If the long shank tap of the application list is carried out, the function which opens uninstallation, a management screen, and a GooglePlay store can be used. It is a screen which displays the detailed information on application. If arbitrary things are chosen from an application list screen, the application information chosen as the application detailed screen will be displayed. It is a function for changing the information currently displayed on the application detailed screen. Selection of the button at the upper right of an application detailed screen will display a resource file display change selection screen. If the resource file information which you want to display from a selection screen is chosen, it will change to the selected information. AndroidManifest.xml of the application chosen when AndroidManifest.xml was chosen by the resource file display change function is displayed. The resource file in the Drawable directory of the application chosen when drawable list was chosen by the resource file display change function can be referred to. Selection of the displayed resource file will display the screen where details are displayed. The resource file in the Layout directory of the application chosen when layout list was chosen by the resource file display change function can be referred to. The screen which displays that details choose a resource file like drawable list is displayed. The resource file in the Values directory of the application chosen when values list was chosen by the resource file display change function can be referred to. The resource file in the Assets directory of the application chosen when assets list was chosen by the resource file display change function can be referred to. sigunature of the application chosen when sigunature was chosen by the resource file display change function is displayed. Although tPackageExplorer can be downloaded for nothing, the function is restricted in part. With the free version, the number of application displays cannot perform a sorting change even with 5 pieces. Please choose "buy" from the option menu of an application list screen for canceling restriction, and perform purchase procedure in the fee collection in an application. 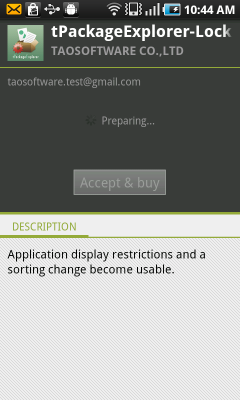 Download from Google Play "Applications -> Tools"
The function in which signature can be referred to is added. The function in which values can be referred to is added. The function in which assets can be referred to is added. A context menu is added on an application list screen.